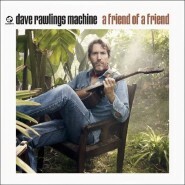 After work­ing with musi­cians includ­ing Ryan Adams, Gillian Welch, and Bright Eyes, David Rawl­ings released his first solo album, A Friend of a Friend, in Novem­ber as Dave Rowl­ings Machine. While A Friend of a Friend shows influ­ences from many of the gen­res Rawl­ings has worked in, it main­ly serves as an entry into the field of coun­try and blue­grass. Unfor­tu­nate­ly, A Friend of a Friend suf­fers from a num­ber of fair­ly seri­ous issues and in the end does not turn out to be ter­ri­bly suc­cess­ful. Dave Rawling’s vocals clear­ly show ele­ments from both coun­try and clas­sic rock, but unfor­tu­nate­ly, it’s not done quite as well as the best exam­ples from either genre. Rawling’s voice often falls into a styl­is­tic whine, which, while fit­ting the genre, is very evi­dent­ly tacked on top of Rawling’s stan­dard vocal style, beg­ging the ques­tion of whether it is real­ly nec­es­sary at all. The best tracks on the album (includ­ing “Method Act­ing / Cortez the Killer”) include seg­ments where Rawling’s Bob Dylan impres­sion works fair­ly well, but they’re cer­tain­ly lim­it­ed - and even more unfor­tu­nate­ly, the restraint that this small bit of suc­cess requires extends to all of the music, mak­ing these sec­tions both the most vocal­ly pleas­ing and the least inter­est­ing oth­er­wise. Lyri­cal­ly, A Friend of a Friend is, more than any­thing else, des­per­ate­ly folksy. Tracks like “To Be Young (Is To Be Sad, Is To Be High)” are exact­ly as deep as could be expect­ed from the title (that one con­tains the line “When you’re young you get sad / And you get high”). For­tu­nate­ly, how­ev­er, that’s the lyri­cal low point of the album. The rest of it is large­ly use­less but benign - there’s not much sub­stance to be found, but at least it’s not painful to lis­ten to. That said, when the instru­men­tals are good, they are very good. The first instance occurs on “To Be Young (Is to Be Sad, Is to Be High),” where Rawlings’s unique, occa­sion­al­ly high­ly stringy gui­tar style inter­acts beau­ti­ful­ly with the almost over­ly-rich bass. But Rawl­ing can do more than mesh tones nice­ly. Many tracks, espe­cial­ly dur­ing vocal absense show excel­lent exam­ples of coun­ter­point and sec­ondary melodies. Pos­si­bly the best track for instru­men­tals is “It’s Too Easy,” which uses an incred­i­ble, rich fid­dle part, backed up per­fect­ly by an active bass and syn­co­pat­ed gui­tar. Dave Rawl­ings is an immense­ly tal­ent­ed musi­cian, and it clear­ly shows on A Friend of a Friend. Unfor­tu­nate­ly, it shows up all too sparse­ly. Most tracks either have sol­id instru­men­tals or sol­id vocals, rarely both simul­ta­ne­ous­ly, and few tracks have tru­ly inter­est­ing lyrics. Addi­tion­al­ly, the album does not seem to be con­struct­ed incred­i­bly care­ful­ly. The dynam­ic changes are often abrupt, and Rawl­ings gen­er­al­ly either goes for loud or qui­et, and almost nev­er some mid­dle ground. Final­ly, the album seems to peter off as it goes, with few­er and few­er tru­ly inter­est­ing tracks as it pro­gress­es. So while the album is cer­tain­ly inter­est­ing, it is not even quite as good as an aver­age album.